A classic pocket trick brought up to date. The magician displays a small steel tube and a miniature steel ball, which sits squarely on top of the tube. Even in the hands of the spectator, it is clear that the ball will not fit inside the tube. That is until the magician stares at the ball and begins to concentrate. With the power of his mind alone, the magician causes the ball to descend into the tube slowly until it is completely inside the tube! 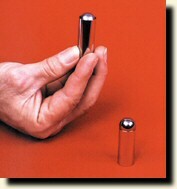 At the conclusion of the trick, the ball rises back to the top of the tube and both pieces can be handed out for examination. Steel Ball & Tube A classic pocket trick brought up to date.